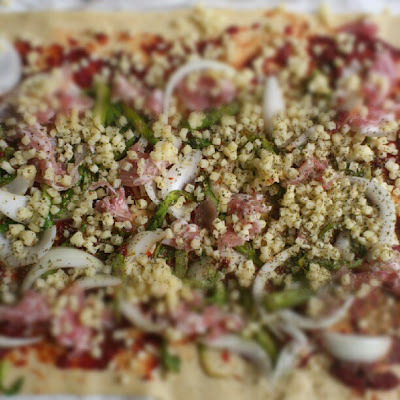 Remember the pizza focaccia I made in this blogpost ? Today I'm making a similar healthy pizza with greens and a special ingredient. Herbamare is a kind of seasalt that holds organically grown veggies and garden herbs. I sprinkled it on my sliced green baby asparagus when I glazed them. Not too much, you don't want the pizza to taste too salty in the end. For a quick preparation, I used a ready made pizza dough ; read instructions before opening the package. Sometimes the dough needs to rest before use. Preheat your oven as indicated. I sliced 1 big onion, tore pieces of pancetta apart and opened a tiny can of tomato concentrate*. I spread the concentrate on the dough (you can also mix it with some ketchup if you're making it for the kids). Divide onions, pancetta and the glazed asparagus. Sprinkle some tiny pieces of mozzarella cheese on top and put the pizza in the oven for 15 minutes tops. * did you know that, when you eat a tiny can of concentrate every day, 2 weeks before you leave on your sunny holiday, the chance in getting a sunburn decreases ? prebaked but it looks so good already !